The Police Command in Lagos State, on Monday, said that the autopsy report on Zainab Nielsen revealed that she died from trauma suffered as a result of the impact on her head. 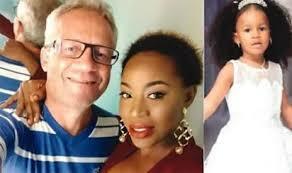 Zainab and her four-year-old daughter, Petral, were reportedly found dead on April 5 at their Banana Island resident, Ikoyi, where she resided with her husband, Peter Nielsen. The State Commissioner of Police, CP Edgal Imohimi, said the forensic report revealed that there were blood stains from the couples’ bedroom to the kitchen. “Blood stains were also discovered on the wash hand basins and on the hand towel the suspect used in wiping his hands after the commission of the of fence. “Although it was cleverly cleaned up as well, the experts were able to discover that too,” Imohimi said. He also said that forensic examinations were being carried out and to be used as evidence against the suspect, Peter Nielsen, who had been charged to court. He also gave update on the arrest of five suspects operating an illegal brewery in Ikorodu Area of Lagos. The commissioner, who presented the suspects to newsmen, said that the result of the samples taken from the illegal brewery to the laboratory was being awaited. “Investigation to ascertain where the product is taken to for bottling or canning is ongoing,” he said.